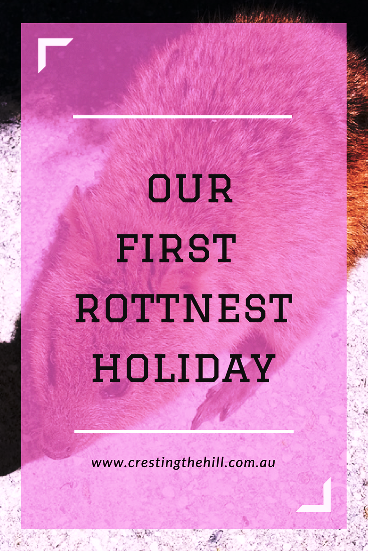 I'm a born and bred West Aussie and I'm a little bit embarrassed to admit that, up until last week, I'd never taken the ferry ride over to Rottnest Island to enjoy some time with the quokkas. 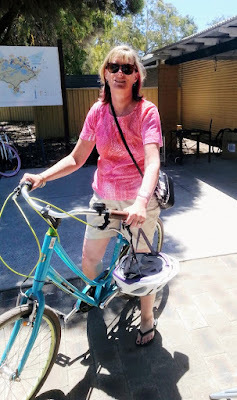 I also hadn't realized that a lot of people don't know that Rottnest is a lovely place where there are no cars (except for a few utility vehicles) - instead you walk or hire a bicycle for your time there. Rottnest has always been a family destination - it has a lot of great (if somewhat over-priced!) 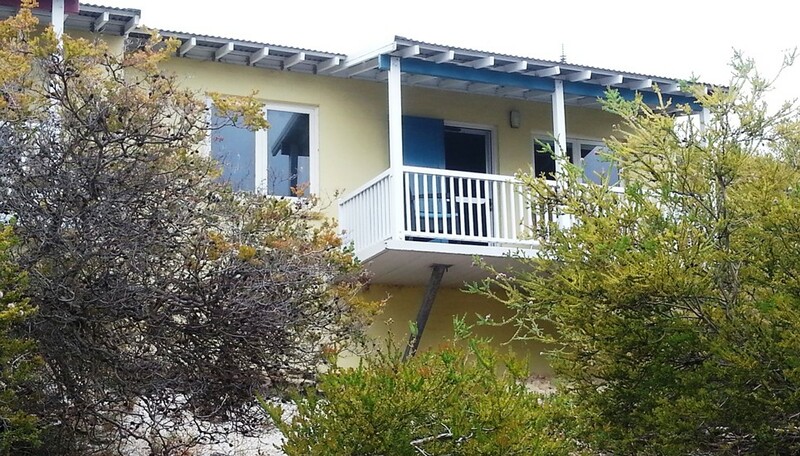 accommodation and not much to do but swim, walk, ride a bike, surf, snorkel, eat, and chill out. Things have gone a bit more upmarket in the last few years with more shops and some classier places to stay, but it's still a very laid back and cruisy destination. We stayed at Longreach Bay in a two bedroom unit with a kitchen, sitting room, bathroom, and balcony with a view. It was a 2 minute walk to the beach - with all our linen etc supplied - and met our needs perfectly. We took the Rottnest Express ferry from Fremantle - much easier and more restful than swimming over (which a lot of die-hard enthusiasts do every year - despite the shark risk!) It was a pleasant 30 minute trip and I was very relieved not to get seasick on the way (although sick bags were on offer if needed!) They delivered our luggage to our accomodation, which left us free to collect our bicycles and grab some lunch in the mall. A lot of people bring their own bikes with them, but it was a long way to haul ours from down in the country, onto the ferry and then onto the island. Instead we chose to hire a couple - a really cheap investment for the five days of our stay. The bikes were surprisingly plentiful in supply and really good quality - BUT the ones that were first choice for everyone turned out to be VERY hard on the bottom and I had a lot of trouble hoisting my leg over the centre brace. Fortunately we decided to go back and see if there were any other styles and I swapped mine for one with more padding in the seat and no cross beam - SO much better on my tail feathers and easier to get on and off. Certainly worth going back and asking the very pleasant staff if I could do a swap. We also weren't given bike locks (an oversight apparently) and both bikes were stolen - one we got back fairly quickly (due to my husband's detective skills), the other went missing on the last night (from our cottage courtyard!) so we reported it and didn't need to get a replacement. The bike hire people were very understanding (apparently the bikes turn up eventually when the conscience-less people who steal them, leave them where they've finished with them.) Next time we'll make sure we get a lock! Quokkas were everywhere (especially around dusk). Clusters of them under trees, in the little shopping mall, on the roadside, and crossing the roads - it was a quokka paradise - and of course I had to have a photo with one! We had one little fellow who came to visit our cottage and was happy to have his photo taken - getting a selfie was too much maneuvering for me so we just had a close-by pic instead. It's recommended that you don't feed them, but this one got lucky with a piece of apple, and they manage to scrounge plenty of scraps around the eating areas. They are certainly well fed and happy looking little souls! A lot of people bring all their food with them, but we chose to pack a few essentials and buy the rest at the General Store - more expensive than the mainland but not ridiculously priced. Plenty of variety and all fresh and easily accessible. There was a great little "mall" with a fantastic bakery and other food outlets and a restaurant or two - something for everyone, so we ate out a lot and didn't really need to cook much at all - something we both appreciated. As I mentioned in my post about our holiday to Singapore last year, Ross and I are chalk and cheese when it comes to what we consider a "fun" vacation to be. He needs to be off being active and I like to sit and chill out with a book. Rottnest was the best of both worlds - he took off on his bike with his surfboard slung over his shoulder, or his flippers and mask packed, and had plenty to do. I sat on the balcony with a book and enjoyed the view and the peace and quiet - then ventured out with him for a ride to the mall or a walk on the beach. Win/win for this Bear Grylls/Carol Brady couple! As a final word, I think the question I ask myself after a holiday (to work out how much we enjoyed ourselves) is "Would we go back?" 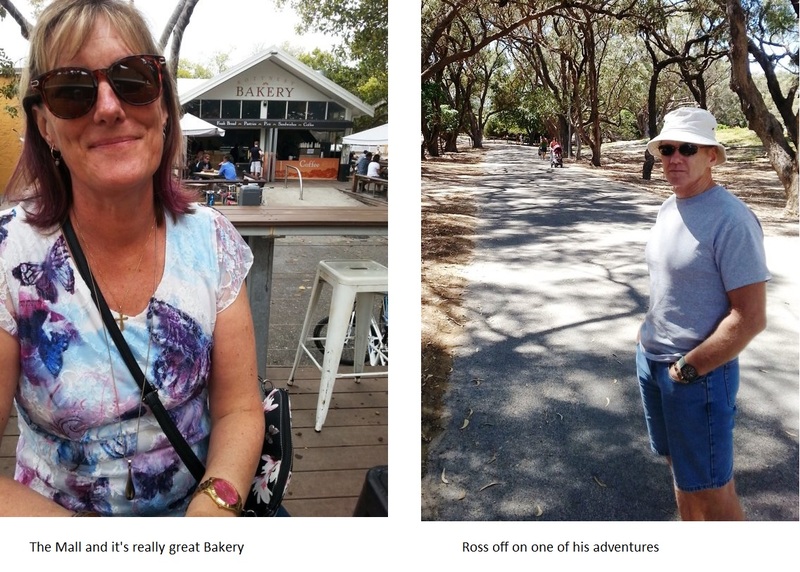 Both of us agreed that we had a fantastic time - beautiful weather, relaxed pace of life, good food, comfortable accommodation, and plenty for both of us to enjoy - so it was a resounding "Yes" to returning and we're thinking that next year might be the perfect time to book another week away. 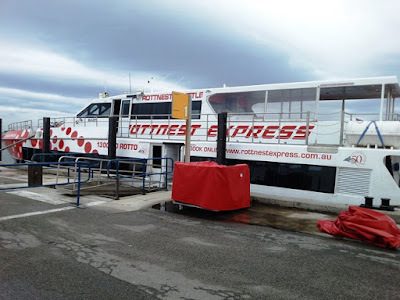 I have been waiting for this post to see what Rottnest was like and how you both enjoyed it. Sounds like my sort of holiday too. I did not realize that there would be so many Quokkas around and tame as well. So glad that it worked out great for you. Hi, Leanne - Like Kathleen, I too was waiting for this post. A place without cars sounds soooo peaceful. I also love your picture with the Quokkas! So glad you enjoyed it! Not quite the Camino Donna, but it was a lovely time away and really good to find something we both enjoyed. I love the SouthWest too Jo but this was so relaxed and felt like we were really away from everything (but with wifi and drinkable water!) And Bear Grylls had plenty to occupy him - always a good thing! Oh my I can't believe this is the first time you have been! I know! I was a bit embarrassed about it until I started talking about going and came across lots of people who have never been there - you'd think all West Aussies would have it ticked off wouldn't you? It looks beautiful Leanne and will be on our list when we eventually get to WA. Loved all the photos and those Quokkas are so cute. It is shame about your bikes getting stolen but at least you found one. You looked very relaxed and I bet it was hard to come home. You're right about not wanting to come home Sue - it's always nice to get back to our routine and the cats, but I felt like I could have stayed there indefinitely and forgotten about the world and all our responsibilities! People have not conscience now days Jo - to actually let themselves in thru the little gate and wheel a bike out of our courtyard was unbelievable. It was a lesson in how low some people will go. Thanks for the Christmas wishes Denyse and they are returned with love - and you're right, there are often touristy places that we avoid because we're locals, but we're missing out because they don't become tourist attractions without good reason. We'll definitely be going back. The quokkas are adorable. It's always fun to go somewhere where there isn't traffic to relax and chill out. Sounds like a fun trip. What a fabulous adventure, Leanne!! Do you know I didn't even know what a quokkas was until I read this??? The "would we go back?" Question is one we always ask too. This sounds like a great visit. It's a good way to figure out how much you actually enjoyed a place isn't Emma - it can be nice but still a "never again" experience - when you know you'd go back then you know you're onto something really good. Totally different post than I expected. I did not realize it was a real place. Yes it is indeed Elise - and a lovely spot to have so close to home - I just wish we'd discovered it sooner! My daughter has just been there and absolutely loved it Leanne! So glad to hear you enjoyed it too but it’s not good about your hire bike being stolen. I must add this to my list now as it sounds like a great place to visit. The bike theft thing is apparently really common - people are scumbags at times - I'll make sure I have a bike lock next time but it was still a fantastic time away. What a wonderful holiday! Any place that requires a ferry to reach sounds like my kind of place! (And I would have passed on the swim over, as well, haha!) 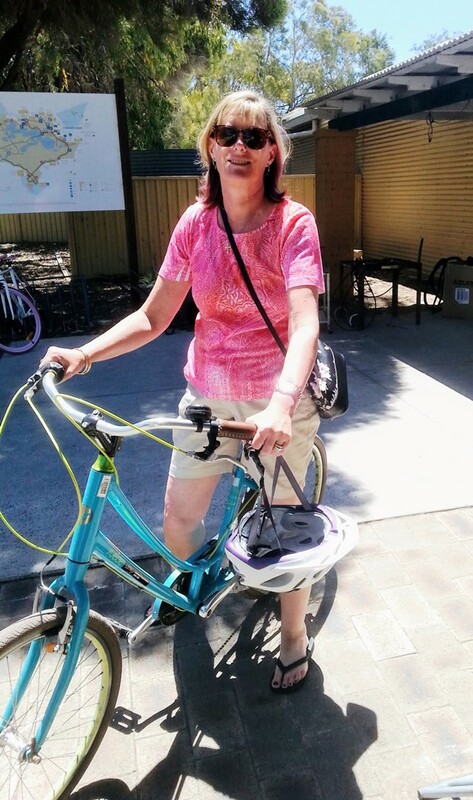 I'm so glad you had a great time (despite the bike thefts!). I really liked the ferry ride Wendy - apparently it's not so flash in wintery weather when the surf's choppy though. So I guess we'll keep our holidays to Summertime! That first photo is so pretty. The high speed express ferry takes 30 minutes to cross and yet some people still swim it for pride? That's crazy. Sounds like the perfect vacation. Sunny beaches, cuddly critters. Just what I like. You can't always understand those people who are into fitness with a risk attached Jennifer - I don't even speak the same language. Give me the ferry any day! You are "chalk and cheese"! That's an idiom I've never heard before, but I hope I remember it for future use! 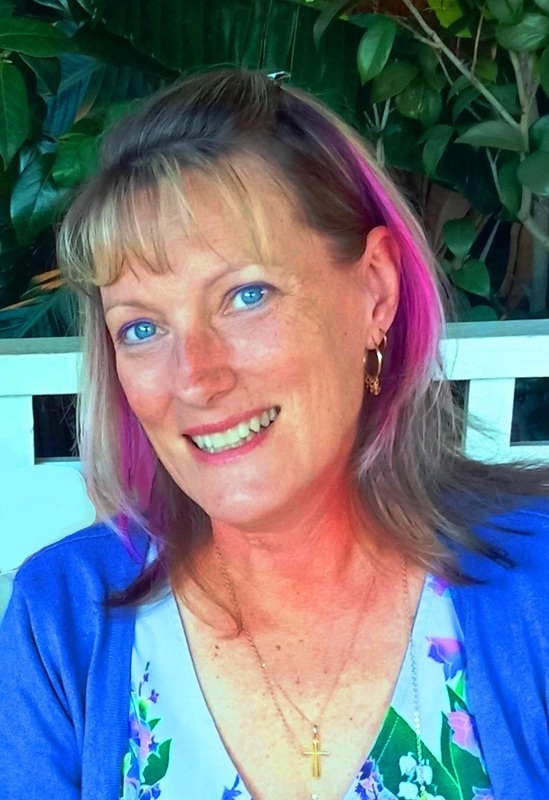 The funny thing is that you seem Australian to me Wendy - you have a similar way of expressing yourself and in your writing, so you'll be right at home here - and you picked a really bad day to visit if it was raining the whole time! This little island seems like an ideal get away. We have a similar place in the US with no cars, Mackinaw island. I was there in September and it was lovely. I have never seen Quokkas before- or even heard of them! They look like little kangaroos. If I were there I would be reading a book too! And biking around the island! What a great post to start our new Link Party with Leanne. I'm so excited about sharing the hosting with you and I think the Party is going to rock! It sounds like a wonderful, relaxing trip and something my husband and I would enjoy as well. Those little quokkas are adorable!! They were surprisingly sweet little creatures and quite tame - very motivated by their appetites so quite bribe-able! It was just the perfect combination of relaxing and having stuff to do for the week we were there. Sue and I are really happy with how people have gotten on board with the party Jo - it's lovely to see other bloggers being generous and sharing each other. 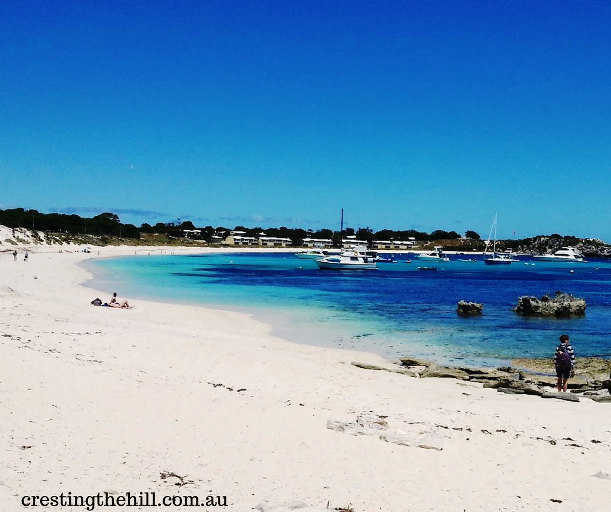 And I really hope you pop over to Rottnest - it would be the perfect backdrop for one of your fashion photo shoots! It sounds like a lovely trip Leanne. When I first read that you chose not to swim, I thought you were joking. I can't believe people swim there! I can swim and do so occasionally in a pool, but swimming in open water frightens me (even without the sharks). I'm with you on loving a relaxing vacation with an occasional outing thrown in. When going somewhere completely new to me, I do like to see the sights. Thanks again for the new link-up. I'm loving it already! I'm so glad you're loving the linky Christie - I think it's been a perfect mix of people and I hope everyone gets on board with the commenting and sharing. And I'm with you as far as swimming goes - give me a pool any day - no sand in the bathers, not seaweed and no sea creatures! My son is living in Australia right now, he went over on a temporary visa and has fallen in love with the culture, people, lifestyle. That old umbilical cord can not pull him back. We went over for a visit a few months back and throughly enjoyed ourselves. Thanks for sharing your adventure to Rottnest Island - I'll pass it along. Good-day! There seems to be a real trade in young people between Australia and the US Cheryl - our friend's daughter just married a Canadian and they are off to live in the US for a while - her mum is missing her already, but I can see the appeal for young people who want to live in a culture similar to their own but with some variety. I haven't been in like 25 years, but I have such great memories of it there! Being from the states (Florida) and never having visited Australia, this was an especially fun read. I'd never heard of quokkas before reading this! Ha!